I recently enjoyed a visit to American craftsman Wharton Esherick’s former studio and home, now operating as a museum, on the top of Valley Forge Mountain in Malvern, Pennsylvania. Exteriors and interiors on the site are amusingly playful yet impressively clever and upon closer examination, carefully calculated. There is barely a straight line in the whole design. Instead the buildings lean under the influence of German Expressionism. Alternating convex and concave edges of the structures’ frameworks as well as the furniture and sculpture that fills these spaces keep the eye roaming. An undulating hand rail outlines a precarious-looking set of spiral stairs and remarkably provides support just where one’s fingers naturally reach. Built-in cabinetry with drawers of the most cunning shapes makes use of every available void. Lamps swing out when needed, a carved wooden monkey hangs from the rafters, and animated sculptures dot many surfaces. All together the environment exudes a dynamic energy. Esherick began his artistic practice as a painter and printmaker, only turning to wood in about 1920 when he started to carve frames for his paintings. His output then expanded to include sculptures, furniture, architectural elements, and woodcut blocks for his printing and publishing projects. With a unique vision that blended the attention to materials central to the Arts and Crafts movement with the influences of European modernisms, Esherick primarily worked on commission to make pieces for those who shared and supported his creative perspective. Around 1950, Esherick met Rose and Nathan Rubinson who would become two of his most longstanding patrons. 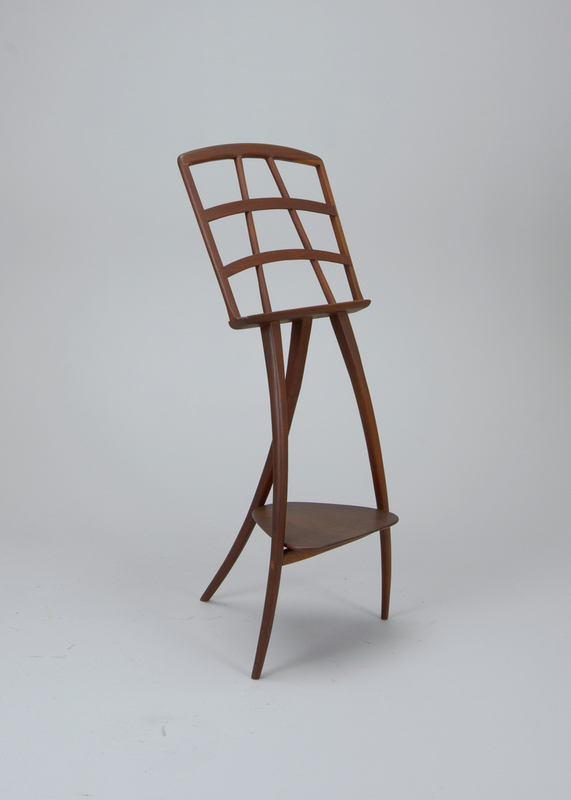 For Rose, a cellist, Esherick made the original model of this music stand in 1960. Mindful of the stand’s user, he included a low shelf on which Rose could place a drink. While most of Esherick’s designs were singular creations, this model was later replicated in 1962 with the help of a studio assistant in an edition of twenty-four, of which this is one. The stand’s organic shape and dramatic sense of expression are trademarks of Esherick’s work. Although static and stable, the nimble lines of the stand give the impression that it might come alive at any moment to dance to the music that it holds.